The reconstruction of 27 complete human limb bones found in Atapuerca (Burgos, Spain) has helped to determine the height of various species of the Pleistocene era. Homo heilderbergensis, like Neanderthals, were similar in height to the current population of the Mediterranean. Along with its enormous quantity of fossils, one of the most important features of the Sima de los Huesos (SH) site in Atapuerca, Burgos, is the splendid state of the findings. They are so well conserved that the 27 complete bones from some 500,000 years ago have been reconstructed. "The incredible collection allows us to estimate the height of species such as Homo heidelbergensis, who inhabited Europe during the Middle Pleistocene era and is the ancestor of the Neanderthal. 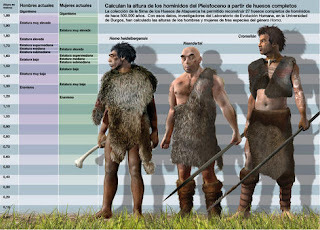 Such estimations are based solely on analysis of the large complete bones, like those from the arm and the leg," as explained to SINC by José Miguel Carretero Díaz, researcher at the Laboratory of Human Evolution of the University of Burgos and lead author of the study that has been published in the 'Journal of Human Evolution' journal. In addition, since bones were complete, the researchers were able to determine whether they belonged to a male or female and thus calculate the height of both men and women. "Estimations to date were based on incomplete bone samples, the length of which had to be estimated too. We also used to use formulas based on just one reference population and we were not even sure as to its appropriateness," outlines the researcher. Since the most fitting race or ecology for these human beings was unknown, scientists used multiracial and multigender formulas to estimate the height for the entire population in order to reduce the error margin and get a closer insight on the reality. As Carretero Díaz points out, "we calculated an overall average for the sample and one for each of the sexes. The same was done with the Neanderthal and Cro-Magnon fossils." The results suggest that both men and women in the Sima de los Huesos population were on average slightly higher than Neanderthal men and women. "Neither can be described as being short and both are placed in the medium and above-medium height categories. But, both species featured tall individuals," assured the experts. The height of these two species is similar to that of modern day population of mid-latitudes, like in the case of Central Europe and the Mediterranean. The humans who arrived in Europe during the Upper Palaeolithic era, Cro-Magnons or anatomically modern humans, replaced the Neanderthal populations. They were significantly taller than other human species and their average height for both sexes was higher, falling in the very tall individual category. Height remained the same for some 2 million years. According to the researchers, putting aside the margin corresponding to small biotype species like Homo habilis (East Africa), Homo georgicus (Georgia) and Homo floresiensis (Flores in Indonesia), all documented humans during the Early and Middle Pleistocene Era that inhabited Africa (Homo ergaster, Homo rhodesiensis), Asia (Homo erectus) and Europe (Homo antecessor, Homo heidelbergensis and Homo neanderthalensis) seemed to have medium and above-medium heights for the most part of two millions years. However, the researchers state that "amongst every population we have found a tall or very tall individual." In their opinion, this suggests that the height of the Homo genus remained more or less stable for 2 million years until the appearance of a "ground-breaking species in this sense" in Africa just 200,000 years ago. These were the Homo sapiens, who were initially significantly taller than any other species that existed at the time. "The explanation is found in the overall morphological change in the body biotype that prevailed in our species compared to our ancestors. The Homo sapiens had a slimmer body, lighter bones, longer legs and were taller," adds the researcher. Carretero Díaz indicates that "larger legs, narrower hips, being taller and having lighter bones not only meant a reduction in body weight (less muscular fat) but a bigger stride, greater speed and a lower energy cost when moving the body, walking or running." This type of anatomy could have been highly advantageous in terms of survival in Eurasia during the Upper Pleistocene Era when two intelligent human species (the light-bodied Cro-Magnons and Neanderthals) had to face difficult climatic conditions, drastic changes in ecosystems and ecological competition.